ONTARIO.–Laguna Hills head coach Jim Martin sat in a green room with three of his players before a post-game press conference, pensively watching as the girls relished the win that is sending them to Saturday’s CIF State Final in Sacramento. For a high school basketball team, there is no bigger prize (thankfully, there is no drawn-out, commercialized national tournament for prep ball). It wasn’t until his wife, Tina, made her way into the waiting area that Martin allowed himself to show a bit of emotion. “This is really sweet,” Martin said, after his Lady Hawks pulled off a moderately shocking 75-69 victory over top-seeded Mission Bay of San Diego in the CIF Southern California Division III Regional finals at Citizens Business Bank Arena. This is the second berth Laguna Hills has earned to the final contest. The last team to do so was the 1997 group that won the state title. Martin said this team has fought their way to the final in a far different fashion than the dominant squad of 15 years ago. Certainly no one was more surprised on Saturday that Mission Bay’s Buccaneers. Ranked 26th in the state, they blew through the competition to go undefeated in the San Diego Section’s Western League and came into Saturday’s regionals with an overall record of 26-7. A team built on speed and smart ball movement inside looked to have almost every advantage…almost. Laguna Hills’ six-foot senior forward Celia Marfone scored 28 points with 14 rebounds, and junior center Anna Mumm poured in 20 with eight boards, but it was their shooting as well as their height that made them so effective. Mission Hills came into the contest with a strategy of outrunning their opponents, but the Lady Hawks stayed with them step for step. The first half was beautifully played, with only ten fouls between the two evenly-matched teams and Laguna Hills leading by a scant point, 40-39, at the half. In the speed category, junior guard Maddy Ziering-Smith was a blur throughout the game, forcing several turnovers and making two crushing steals in the fourth quarter. One of the final daggers came with just under four minutes to play in the final frame and Laguna Hills leading, 64-58. With the Mission Hills defense double-teaming Marfone, senior guard Brooke Shimazaki found a comfortable spot behind the arc and screamed for the ball. In one fluid motion, she caught the pass, squared up and let the shot fly. It barely touched the rim on its way through the net and the Lady Hawks bench knew their season would be extended for one last hurrah. Shimazaki, who finished with six points, said there could be no better way to cap off her senior and final season. She added that throughout the playoffs, she hasn’t had to battle the butterflies that come with the pressure. 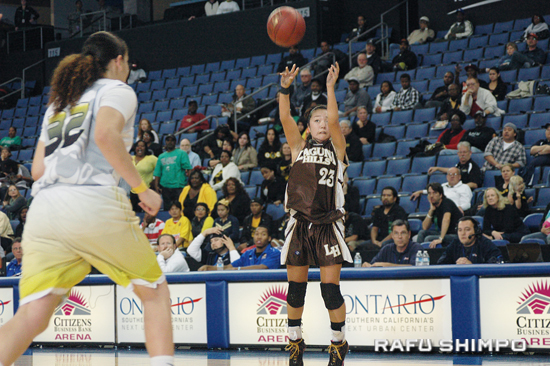 Laguna Hills (26-8) will face 29-3 Bishop O’Dowd of Oakland on Saturday for the title of Best in California. Tip-off at the Power Balance Pavilion (formerly Arco Arena) is set for 1 p.m.
Foothill’s Kourtnee Kanemaru shoots over Pricilla Brooks of J.W. North in the Div. II regional final. Kanemaru finished with one point. The ride home from Ontario to Orange County was a much longer one for the Knights of Foothill, however. In the Div. II regional title game, they managed to keep pace but eventually fell to J.W. North, a team that has appears to have been reborn in the playoffs, 57-49. 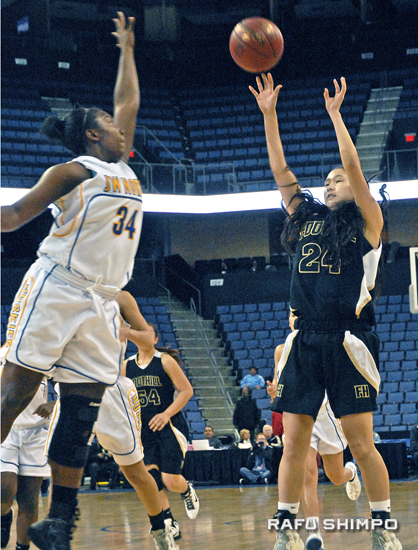 Foothill senior Kourtnee Kanemaru, playing in her final prep game, managed only one point in 14-plus minutes of action. After the loss, she did her best to comfort her crestfallen teammates, but emotion got the best of her on the way to the locker room. Foothill head coach Vince Namba said his team navigated uncharted waters in getting to the regionals. “The fans have been great, the parents have been great and we couldn’t ask for any better support,” he said. Namba said that perhaps some big-game jitters contributed to his team’s 18 turnovers and missed opportunities. “North is a very, very good team, and they forced us to make mistakes,” he explained. Kanemaru still has a list of colleges from which to choose before fall, but one thing is clear: her playing days, at least for a school, are likely over. It will be equal time in the spotlight for the boys and girls of Mater Dei on Saturday, as both teams have earned their respective spots at the State Finals. The girls outlasted Long Beach Poly, 54-43, to earn the right to face Berkeley in the Div. I State Final. Senior Kristine Yee did not score for the Jackrabbits in the loss. The boys used every player on their bench in a 85-66 rout of Fresno Bullard, 85-66. Jamie Kobayashi played but did not score for the Monarchs, who will try to win back-to-back State titles when they play Sheldon Saturday at 8 p.m. The men of Mater Dei have eight CIF State trophies in the case, to go along with 21 Southern Section titles. Brianne Yasukochi scored nine points and dished out six assists, as La Jolla Country Day’s girls bested Serra in a defensive battle in the Div. IV regional final played at Colony High School, 46-36. The Torreys will play Salesian for the state crown at 3:30 Saturday afternoon at the Power Balance Pavilion.